Preheat oven to 400F. Boil a large pot of salted water for cooking the pasta. While the oven is preheating and pasta water is boiling: Peel the butternut squash and cut it into 1.5-2 inch cubes. Place in a large baking dish. Add 2 garlic cloves. Drizzle with 2 tablespoons of olive oil, and season generously with salt and pepper. Stir, and make sure the butternut squash is in a single layer on the baking sheet. Roast at 400F for 15-20 minutes, or until the butternut squash can be pierced easily with a fork. While the butternut squash is roasting: Cook the pasta to al dente according to the package instructions (about 12-13 minutes for rigatoni - this may vary depending on your brand of pasta). Drain the pasta, but reserve 2 cups of cooking water and strain it into a heat-proof container! You'll need it for the sauce. 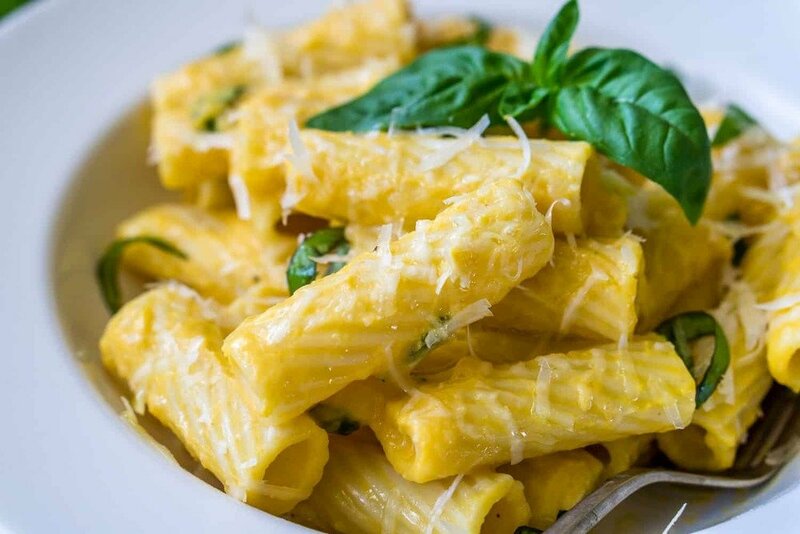 Return the pasta to the cooking pot and toss with the remaining tablespoon of olive oil. Make the butternut squash sauce: Add the roasted butternut squash to a blender. Add the roasted garlic. Add 1/2 cup milk and 1/4 cup half and half. Process until smooth. Finish the pasta: Add the cooked pasta back to the pot. Turn the heat on low, add the pureed butternut squash sauce to the cooked pasta, and stir. Add the fresh basil and grated Parmesan cheese and stir. Add up to 2 cups of reserved cooking liquid (1/4 cup at a time) to thin out the sauce, if necessary. Continue cooking for 2-3 minutes, or until the sauce is heated through. Serve immediately, garnishing with extra basil and Parmesan cheese. Or follow the next optional step. Optional: Turn the oven on to broil. Add the finished pasta from step 5 to a 2.5 quart casserole pan. Top with a mixture of 1/2 cup shredded mozzarella cheese and 1/2 cup grated Parmesan cheese. Broil for 2-4 minutes, or until the cheese melted and starts turning golden brown. Carefully remove from the broiler and serve immediately.